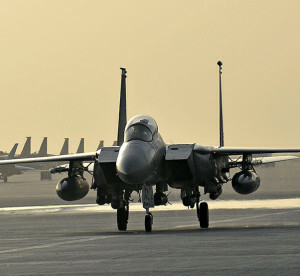 An F-15 Eagle taxis on the flight line in an undisclosed location in Southwest Asia. 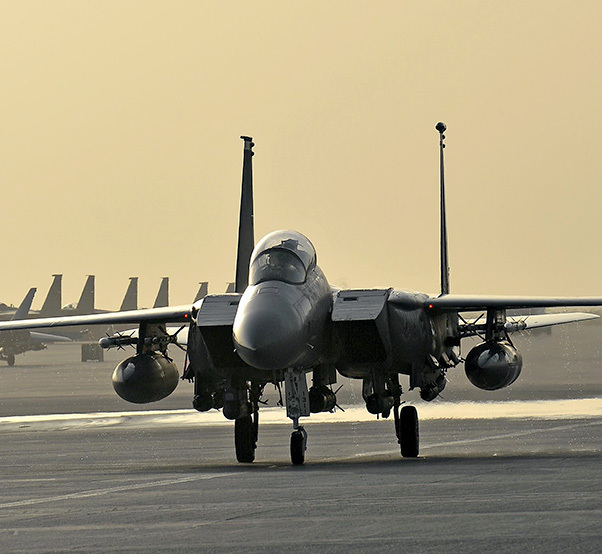 Throughout the month of May, the air coalition has been able to strike lucrative targets including: logistics lines, command and control and Islamic State of Iraq and the Levant financial resources through more than 1,800 strike sorties. Throughout the month of May, the air coalition has been able to strike lucrative targets including: logistics lines, command and control and Islamic State of Iraq and the Levant financial resources through more than 1,800 strike sorties. The air coalition has an array of precision capability available to strike targets and defend the region. Weapon systems officers assigned to the 380th Air Expeditionary Wing discussed their combat role and the importance of teamwork when flying and employing precision ordnance from the vantage point of the two-seat F-15E Strike Eagle. Maj. Justin, also a WSO assigned to the 380th AEW, explained how various organizations work together to successfully destroy a target. JTACs determine target locations from strike cells, while unmanned aerial vehicles and intelligence personnel deliver imagery and situation updates. Weather personnel provide updated briefings, maintainers work day and night to prepare the jets to fly, and airfield management Airmen clear the airfield for appropriate munitions, according to Justin. According to Dan, once in flight, a WSO has several things running through their mind in preparation for strike operations. There are a number of checklist items that must be calculated to ensure precision and accuracy. Justin also discussed the precision and care that is taken when employing targets. “The targets I’m assigned to destroy have been vetted through the most professional members of our armed services, and (I know) that others are taking their jobs as seriously as I am,” Justin said. Dan said destroying critical targets that diminish the capabilities of terrorist organizations and protecting ground troops are critically important mission areas. Editor’s note: Due to safety and security concerns, some names were removed.